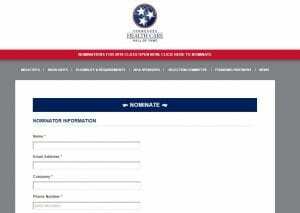 Step 1: Visit tnhealthcarehall.com to begin the nomination process. You’ll start with your information, before moving on to including information about your nominee. Step 2: Here’s where you starting bragging! You’ll include key information about the person you’re honoring including their educational experiences, their professional positions, appointments, honors and accomplishments. In addition to this basic information, the Selection Committee (made up of representatives from across the state) wants to know about how the nominee has been a role model throughout the community, their ethics or professionalism and the impact they’ve made on their community. Step 3: Letters of Support — The Selection Committee will need at least 2 (and no more than 5) letters of support for each nomination. This allows them to have a more holistic view of the nominee and the impressive work they have accomplished. This is why it’s so important to start nominations as early as possible! Step 4: SUBMIT! And that’s it! *One thing to note: The system will allow you to save and continue your nomination at a later time. This is especially key as you’re inputting information, but aren’t ready to submit the entire nomination, yet. Use this setting to your advantage as you go! We appreciate your support of the Tennessee Health Care Hall of Fame; we’ll see you at the induction event in October 2019!